The Citroën 2CV (French: “deux chevaux” i.e. “deux chevaux-vapeur” (lit. ‘steam horses’), “two tax horsepower”) was an economy car manufactured and marketed by Citroën between 1948 and 1990. It was technologically advanced and innovative, but with utilitarian looks and simple metal bodywork — initially corrugated for added strength without added weight. The 2CV was designed to motorize the large number of small-holder farmers in 1930s France, who were still using horses and carts. It was designed for low cost, simplicity of use and maintenance, versatility, reliability, low fuel consumption and off-road driving. 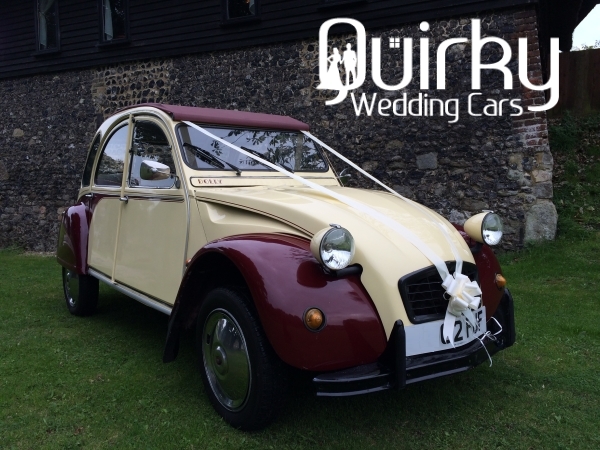 This Wedding car is available for Weddings across Kent – we are also able to provide service in surrounding counties subject to additional hire fee. To obtain a no obligation quote to your exacting requirements, please send details using the form below. If you would like to check availability or receive a no obligation quotation please send us some brief details of your requirements either via our live chat tool in the bottom right of this page, call us on 07932 970154 or use our contact form below. Alternatively, if you would like a quote for any of our other cars, please use our main quotation request page. PLEASE NOTE: An automated acknowledgement of your Quotation request will be sent to your email within 60 seconds from Contact@QuirkyWeddingCars.co.uk – if this is not received please check your “Junk” or “Spam” email folders and add us to your safe senders email list to ensure that you receive our quotation. We aim to reply to all requests within 48 hrs of receipt – if you do not hear from us, please call 07932 970154 to confirm your quote. Copyright © 2019 Quirky Wedding Cars. All Rights Reserved.